Hi all! As most of you know, I am back in Oz now. Super sorry for the delay in posting this final entry from this trip, but here I am finally getting to it. So with this you will be all caught up on my 3.5 month long adventure. I said goodbye to my lovely hosts and colleagues Lauri and Paivi at Aalto, and set off to Helsinki Airport for my flight home. It was a close to midnight departure with Finnair, heading home via Hong Kong. I arrived at the airport pretty early, which ended up being lucky, as everything was close to closing when I arrived, which meant I had a chance to grab a bite to eat before my journey. So after about 9pm the airport was super quiet, with just those of us with late flights wandering about the one duty free store open. Thankfully abundant power points and free wi-fi kept me entertained. The trip to Hong Kong was uneventful in all the best ways. I got a tiny bit of sleep… just a couple of hours which was enough to put a little juice in the batteries for arriving in Hong Kong at about 2pm their time. I had a 6hr stop over… long enough to mean staying in the airport wasn’t an option, but so short that I really didn’t have too much time to get up to much. But that wasn’t really the question to be answered, rather… how was going in going to be with the protests that had just hit in the previous couple of days. In the couple days before leaving Finland I saw the coverage of the protests as they escalated to tear gas and thought “hhmmm… getting in to HK may not be so wise”. But on arriving, the thought of 6hrs in the airport was much worse, so I decided to head in. I did ask one official looking dude how it was in the city, but he didn’t really understand what i was asking, so I gave it a crack. As it turned out, it was a wise move. The City Express train got me in in no time, and I headed to my first stop, Jantzen Tailor. When in Hong Kong, get a new suit and shirts! I made it there easy enough and picked my fabrics. With all my details on file from last visit, all it took was some check up measurements, paying, and then expecting my new duds to arrive back home in a week. How easy is that! With that job done, I headed back toward the main Hong Kong station through the overpasses, and saw the fringe of the protests. With plenty of time, I decided I had to explore it at least a little. What was most compelling about heading down into it was Connaught Rd and how eight usually busy lanes of road were blocked off. Normally walking over the walkways between stations would have you high above bustling traffic. Instead this time it was all quiet. So I popped down to ground level and headed toward the protesters. As I got closer, the road was blocked with makeshift barricades. Part of me was surprised that the police had not removed them, but then I guess the road was officially closed, so as soon as they were removed I imagine more would appear, so they were probably best left alone. Along the way more small signs and protest messages started appearing. I was still a fair way from the main site near the government buildings so I imagine they were much more prominent there, but they started to give a sense of what it was all about. 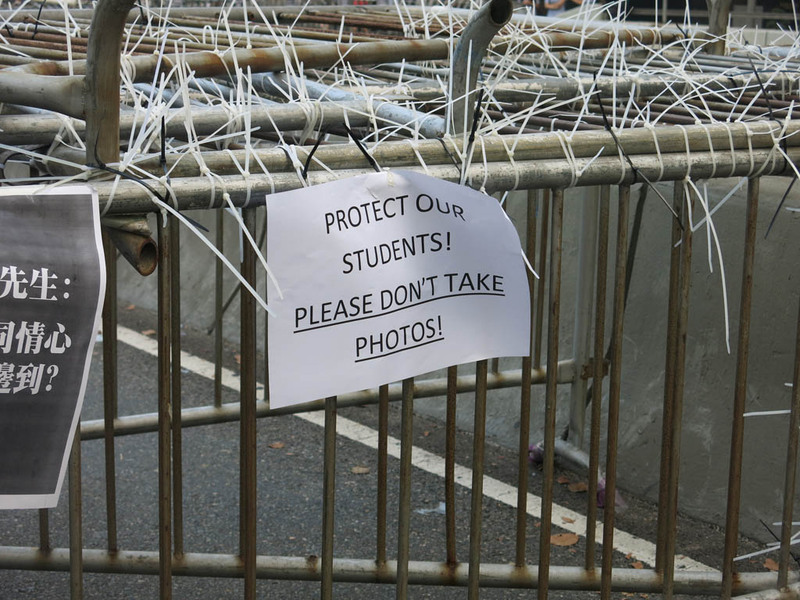 There were also signs asking for people not to take photos of the protesters, which was completely understandable. Where I was wandering were many tourists and stickybeaks (like me) and I imagine it has become quite the thing to go and have a look at what is happening. 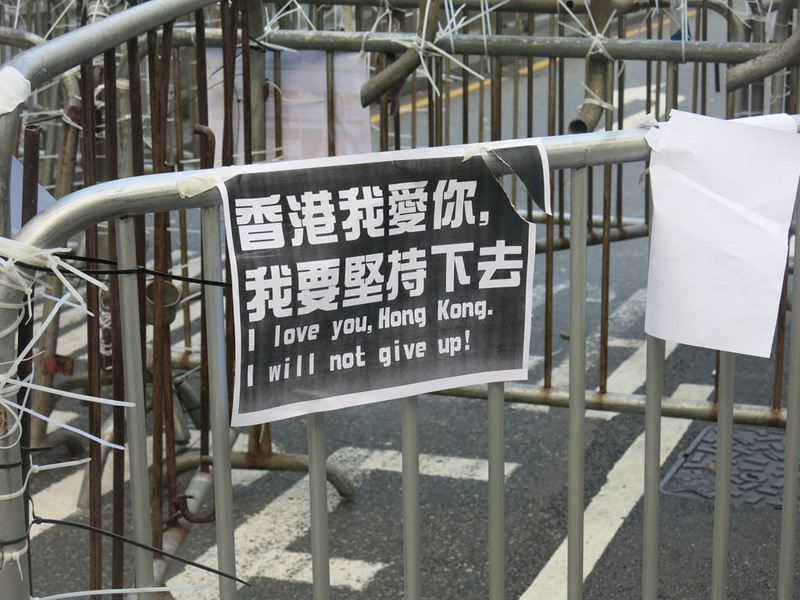 As I walked further up Connaught Rd, the crowds began to build and the voices of the protesters could be heard. This was still the quiet part I imagine, as as I went further toward Admirality, the crowds began to build. It was quite something to wander amongst it, possibly part of history. 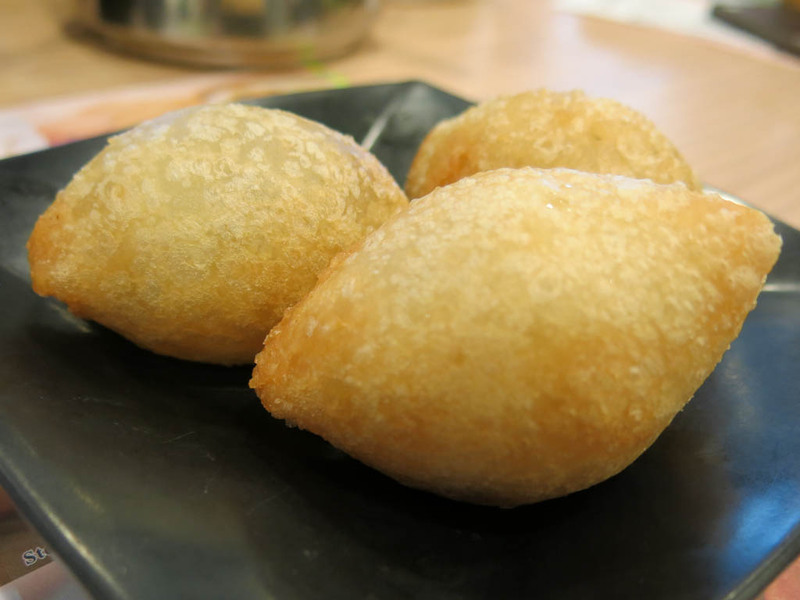 After soaking up the atmosphere for a little, the heat was getting the better of me (about 35 degrees and I swear 300% humidity), I thought it was time to check off my other must do in Hong Kong… a visit to Tim Ho Wan! And the verdict? Well, I was a bit disappointed to be honest. The pork buns were just as I remembered…. all sweet and slightly crispy and porky goodness. But the other dumplings were a bit so-so. The pork dumplings were a bit cold and the chiu chow style dumplings were not great (still not sure exactly what they were). It was OK though… I was still happy to have some so-so yum cha rather than airport food and the pork buns were again the stuff dreams are made of. So while disappointed, I was satisfied. I had one more thing on my to do list, the Kaws exhibition at the gallery at Harbour City Shopping Centre, but alas time was against me. Having visited the protests, I didn’t really have time to go to the Kowloon side, visit, then back to the HK side to get my airport train. Buses were not an option, as the protests had disrupted all road transport. So with that it was time to head back to the airport. In no time at all I was back, with an hour and a half to spare. Just enough time to freshen up a little and rest before getting on my leg home. Being Finnair, they codeshare with both Cathay Pacific (who I had on the way over) and Qantas, who I got on the way back. Boooooo. No offence Qantas, but boy you are past your prime. The plane was as old as the hills and full of rattles, very sub par entertainment system, and even the food you could get right, with me being in the middle of the plane and not getting my choice either time. Not great when you spend so much money. And to top it all off I had a nearby passenger spill some beer over my feet and a rude (although very soon after very apologetic) hostie when I asked for a towel. Oh well. It happens sometimes. And with very little sleep (i.e basically none) and crappy movies to keep me company, I made it back to Melbourne, with a beaming Kate waiting eagerly. With that, 3.5 months were over and I was back home. Ahhh.